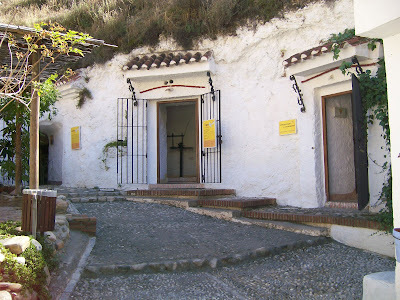 I had heard something about there being some gypsy caves somewhere north of Granada, but I thought they were outside of town and difficult to get to. 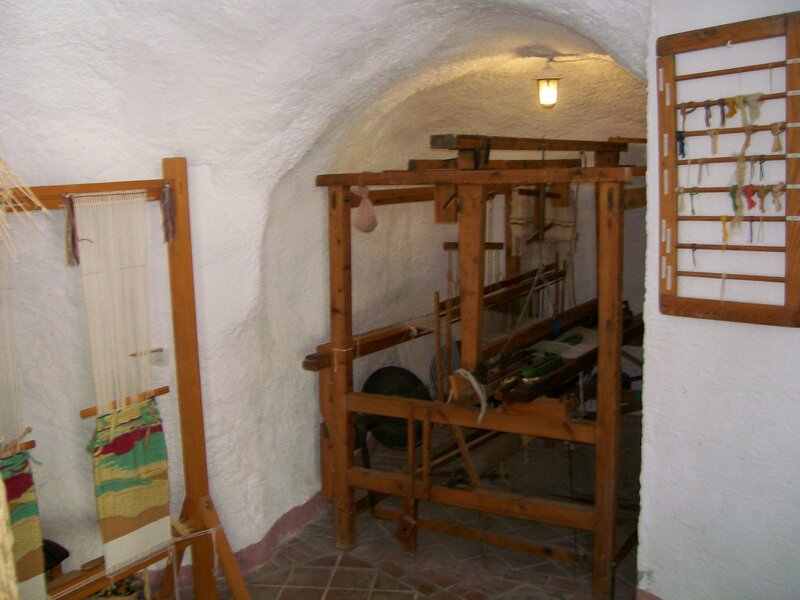 Besides, I was in Spain to see Moorish architecture, not some gypsy caves that were probably some rip-off tourist attraction. I had come to see the Alhambra, the wonder of Islamic architecture and art! And, indeed, the Alhambra was wonderful, but that is a story for another day. 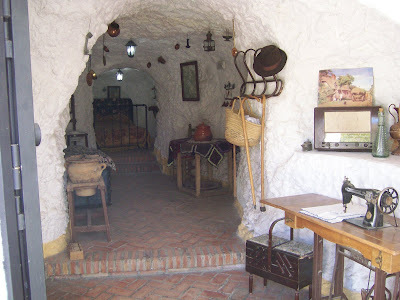 I only bring it up because it was from the Alhambra, looking out across the Darro River, that I realized that I could see the Sacromonte right there, and it was true - there were caves! I could see the dark openings that were the doorways into the cave dwellings. I knew right then what I would be doing the following day. Because I was traveling with an ancient travel guide with about 1 1/2 pages on Granada, I didn't really know much of anything about what I was going to see. The lady at the desk in my hostel told me to turn right, walk through the Albaicin, the old Arabic quarter, and then just keep following the road up the hill. As I walked up the road that started as Carrera del Darro (the name changed a few times along the way) with the Darro River on my right and a hillside covered with homes on my left, I began to notice that the houses backed right up to the hillside. The houses all seemed to be only one room deep, but I later learned that these houses were actually the entrances and front rooms of caves. I imagined that they started out as small houses that later expanded right into the hillside when the owners had more money and needed more room. But I suppose it could have happened the other way around. 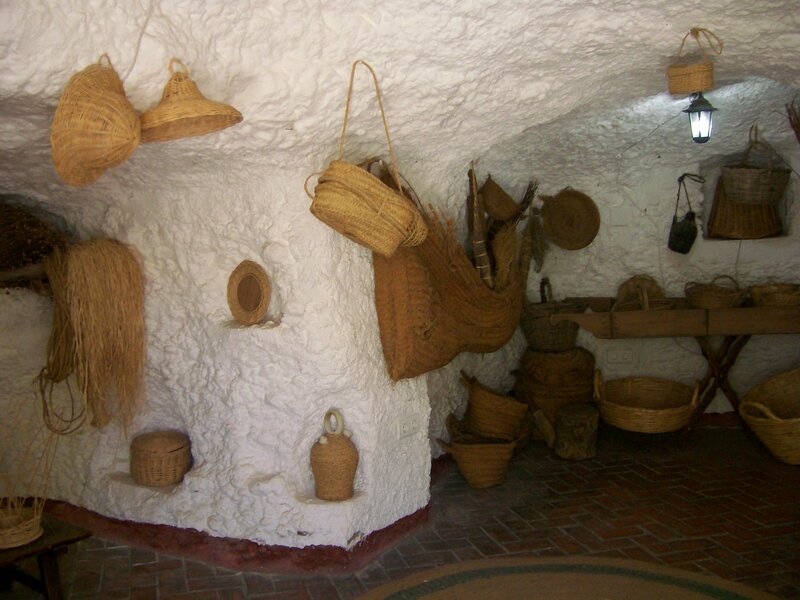 Maybe they started out as cave dwellings and then the owners accumulated enough money to build a "respectable" entrance. 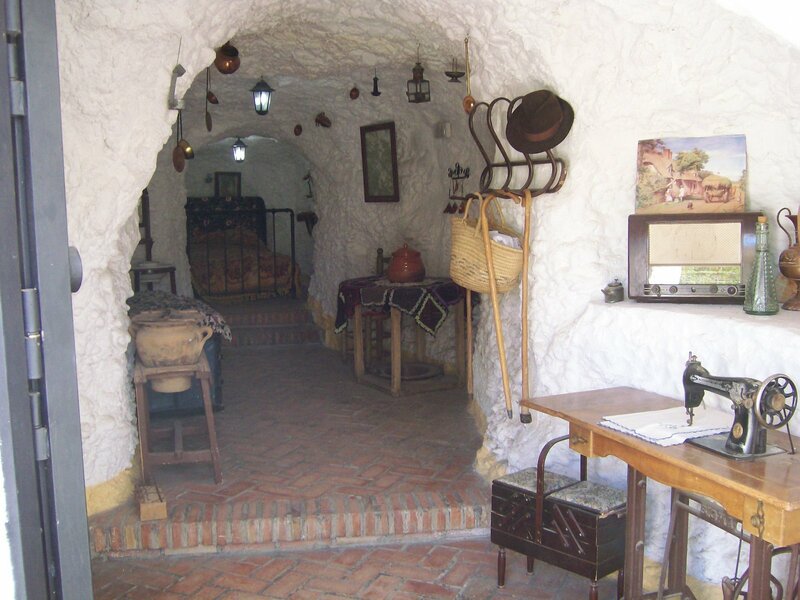 On this lower level, many of the cave/homes have been turned into bars and restaurants where tourists are entertained by "Gypsies" dancing a Flamenco variation called Zamba. By the way, the word "gypsy" and the Spanish "gitano" both come from the idea that these people came from Egypt. It turns out that they originated in India and spread out into areas settled by Muslims. 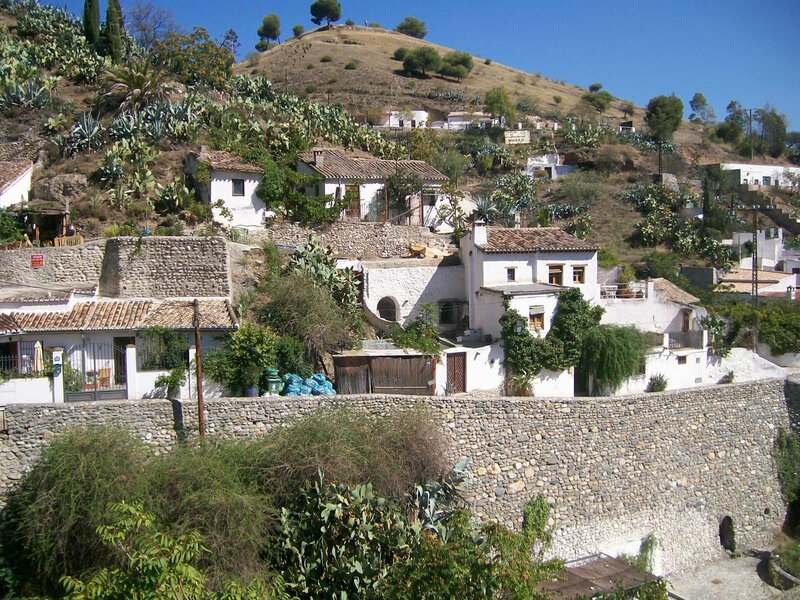 From the 13th to the 15th centuries, Granada was the capital of the area of Spain controlled by the Moors. 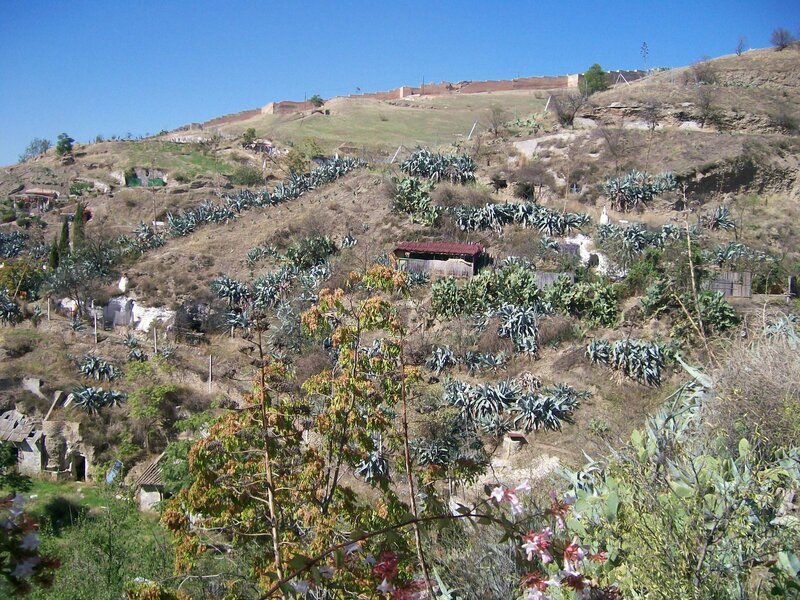 The proper name for them is "Roma" and the Sacromonte district is the home of their community. The Camino del Sacromonte (same road) eventually turned into a long, steep, hot path that led up the hillside to the Center for the Interpretation of Sacromonte, an outdoor museum that explains living in the caves. There are quite a few of the caves that have been fixed up to represent what life in a cave would be like. 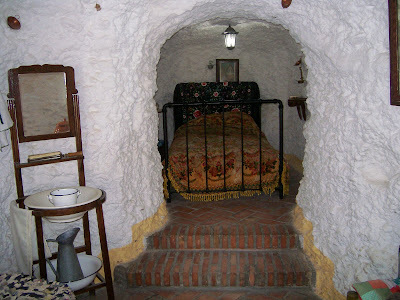 Although the caves did eventually have plumbing and electricity, I suspect that what I saw was pretty idealized, at least for the old days. The caves were built into both sides of a ravine, so the base of the ravine became like a road between the houses. The soil is sedimentary deposits of clay and small pebbles, so it was fairly easy to dig out, yet also quite strong. I imagine that the caves became river-front property during a rain storm. Actually, heavy rain in 1962 is what eventually drove many of the people out because parts of their homes collapsed and washed down the hillside. The insides of the caves are much brighter than I expected because they are all painted white to reflect any ambient light. 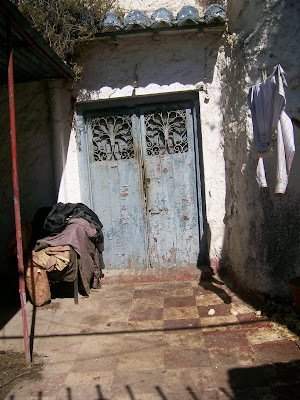 Now that they have plumbing and electricity, I think they'd be pretty cosy. And since they are caves, the temperature would stay pretty much the same year around. It turns out the story as I've told it so far may be a bit of a fairy tale concocted for tourists. Who doesn't love stories about Gypsies? But some say that the Roma didn't actually arrive until much later, and when they did, they moved into homes that had been abandoned by earlier owners. The Moors actually ruled much of Spain for almost 800 years.The Moorish area was called al-Andalus, today's Andalucia. Of course, the former rulers of the area weren't impressed, but the Moors were pretty nice to the people they had conquered. They brought southern Spain out of the dark ages, supporting arts and sciences and developing new agricultural techniques. They built schools and mosques, palaces and public gardens. They allowed Christians and Jews to live where they wanted and worship as they pleased. Then Isabel and Fernando got married, reuniting the rest of Spain and driving out the last of the Moorish leaders. They also revived the dreaded Inquisition, which began torturing and executing Jews and other non-Christians. 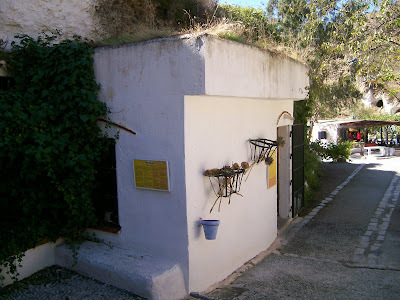 The Jews and the remaining Muslim people fled for their lives, abandoning their homes and hiding out in caves they carved into the sides of the mountain. This side of the story says that the Roma didn't arrive until the 18th century. By then, the Inquisition was long past and the Jews and Muslims had again been admitted, marginally, into society. 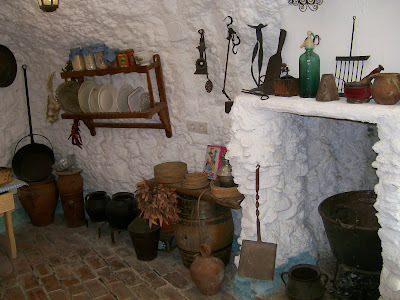 This final photo is a more realistic shot of one of the house/caves that doesn't belong to a restaurant or the museum. I don't think this one would be so nice to live in. Its a good story, I have really loved that adventure. I would love to visit those caves. 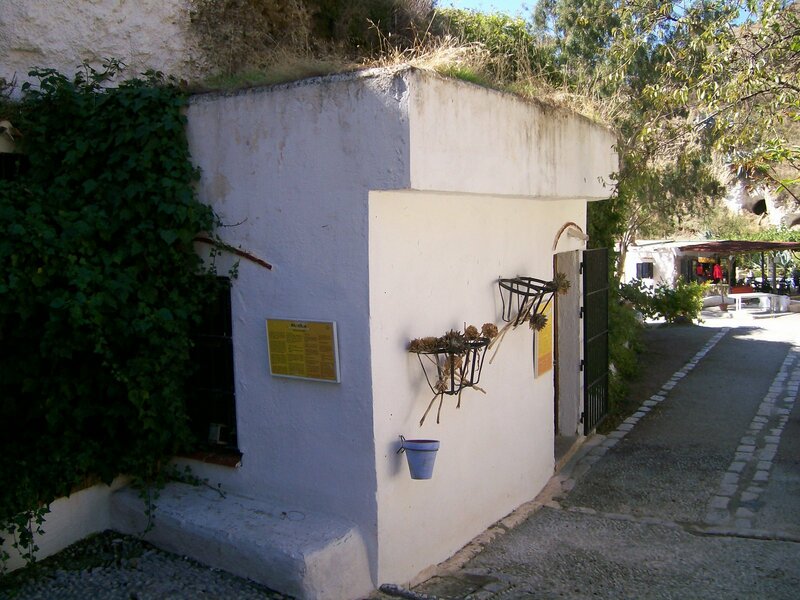 I want to go to the cave village and hear the musicians and poets that frequent them. I would want to stay and cool off. I would like to drink sweet wine on ice and have a nap.